This page is all about me! Welcome to the original Samui info and weather blog. Established in February 2007 and online every day since with a weather update, by long term resident Camille Lemmens who lives on Koh Samui since November 1999. That is me. In February 2017 I switched to weekly weather updates on this blog, after having had a flow of 10 years of daily weather updates. Besides weather updates I blog about local and upcoming events around the island, different restaurants around the island and interesting places to visit for locals and tourists. Once I'm on the mainland or in general outside of Koh Samui, I also blog about the places that I visit with my family or places I visit for work. During these visits I also blog about similar things, good local restaurants, places to visit or other things or places that seem to be of interest. Since late 1999, Camille (that's me), since I arrived on Koh Samui, has been working in the dive industry as a PADI Instructor. I became a PADI Course Director in 2003 and have been actively working in that capacity around Thailand, among others on Koh Samui, Koh Phangan, Koh Lanta, in Khao Lak and on Phuket and I also ventured out to Indonesia, the Philippines and South Korea. In the meantime I also became very active online and right now I'm running various dive related websites and blogs and am also active an various social media, including Facebook. Since 2002 I have been married to a local Samui woman and together we have 3 children. My hobbies are besides diving and football; running. 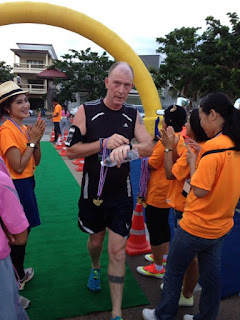 I run races around mostly Southern Thailand but have also raced in the Philippines and Indonesia and I'm looking forward to expand my running experiences. A handful of marathons are under my belt but my favorite distance is the half marathon. Mostly I run in what they call 'mini marathons' in Thailand, or quarter marathons, around 10km in length.